Quick weekend projects around the home can give a feeling of accomplishment and lift your mood! Furniture and home decor pieces can often be repurposed and refreshed and it doesn’t have to always be an all day affair. Think of your needs and look around your home and rather than getting overwhelmed, pick just one or two projects to delve into. What are your areas that need a bit of sprucing around the home? 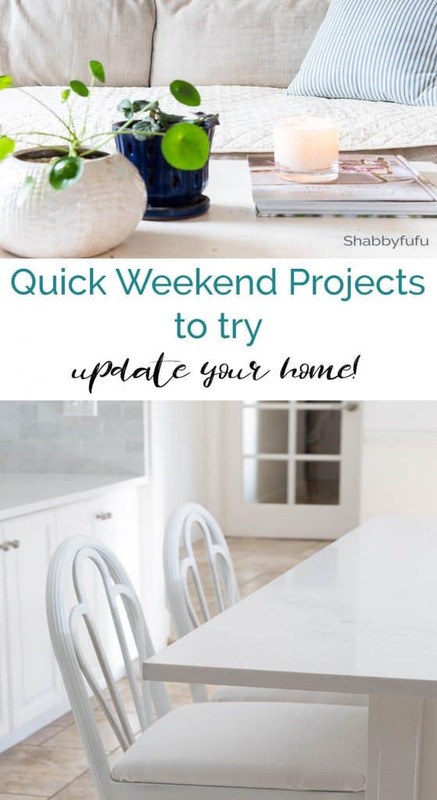 Perhaps rather than tackling a big cleaning or organizing project you’ll just enjoy the process and outcome more of some quick weekend projects. I’m all about immediate gratification just as much as I’m all in with complete room renovations! Today I’m sharing two projects that I did and they took less than half a day total. Hey Toby…you’re Mr. cool and slick! 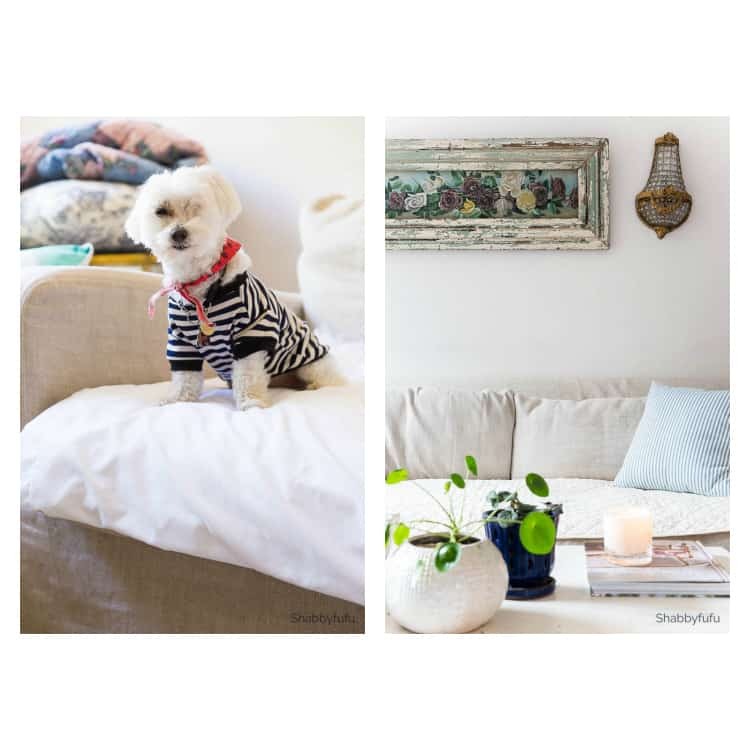 In this post, one of the quick weekend projects that I’ve been planning to do for some time was motivated by the fact that I have 3 dogs. In our household the dogs are indeed allowed up on the sofas because they are part of the family and deserve it! In THIS POST you’ll see all three of them on my white living room sofa that is slipcovered. Above is one of the family room sofas and it’s slipcovered as well. We purchased it a couple of years ago at the Restoration Hardware Outlet and have always had a blanket or sheet on top because…it was expensive. I’m actually selling this sofa and will be sharing something new coming soon, so I wanted to keep it well covered. I purchased a King sized diamond quilt similar to THIS ONE and for this quick weekend project I knew that it would be perfect. Super budget friendly too, because you can purchase premade sofa covers but they cost more. First the quilt was laundered to get the sizing off and make it easier to sew. Then I took a pair of pinking shears and cut the quilt down the middle lengthwise. This room currently has two sofas in it and you’ll see more of my finished room that I’ll be revealing soon! After cutting I ran each of the cut edges through my serger to keep them from fraying long term. No serger? No problem and just apply some of THIS STUFF that works like a charm. Laying the quilt across the sofa lengthwise and tucking it under the back cushions is simple and it looks a whole lot more classy than a sheet! Now on to quick weekend projects number two…kitchen barstools. 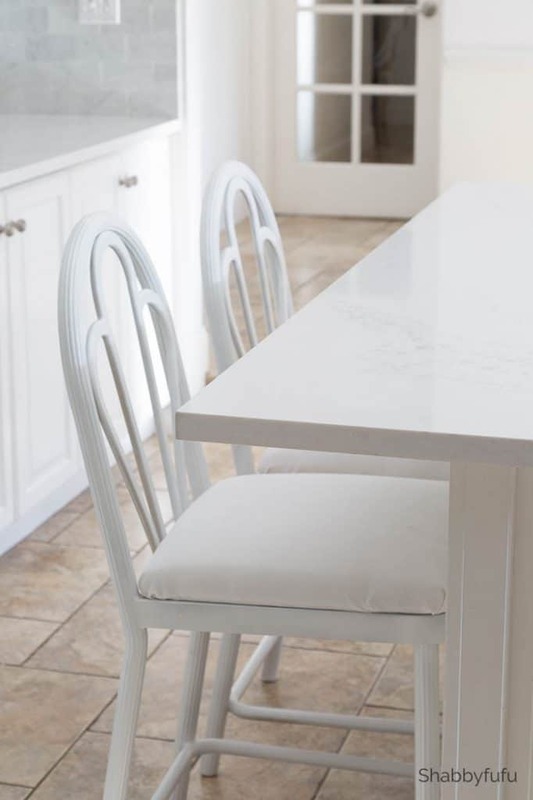 If you’ve seen our KITCHEN REVEAL we love the updates that we were able to do on a budget! Kitchen updates in general are not quick weekend projects, but even with those you can make huge impacts by changing a light fixture or cabinet hardware. In our kitchen remodel, by keeping the existing kitchen cabinets and changing out only the countertops and backsplash it looks completely new. The barstools were custom made for us when we purchased this home over 25 years ago, but they were outdated. In my efforts to be thrifty and because I genuinely love barstools with open backs I decided to revamp them. Open back barstools let the light through and that’s something to consider if you’re looking for new barstools. While I love THESE STOOLS from Serena and Lily, everyone has them now and I prefer not to follow and lead by my own choices. Take a look though, and I say if you love them then go for it! I took the existing tapestry fabric off the barstools first and saved them to use as a template. Then I brought the bar stools outside and sprayed them with THIS PAINT that is a high performance paint that won’t easily scratch. I purchased a yard of indoor/outdoor white heavy duty twill fabric and because this is a kitchen I sprayed with fabric protector. Using my heavy duty staple gun the fabric went on in about 10 minutes per chair. Talk about a simple project for a new look…this takes the cake around my home! 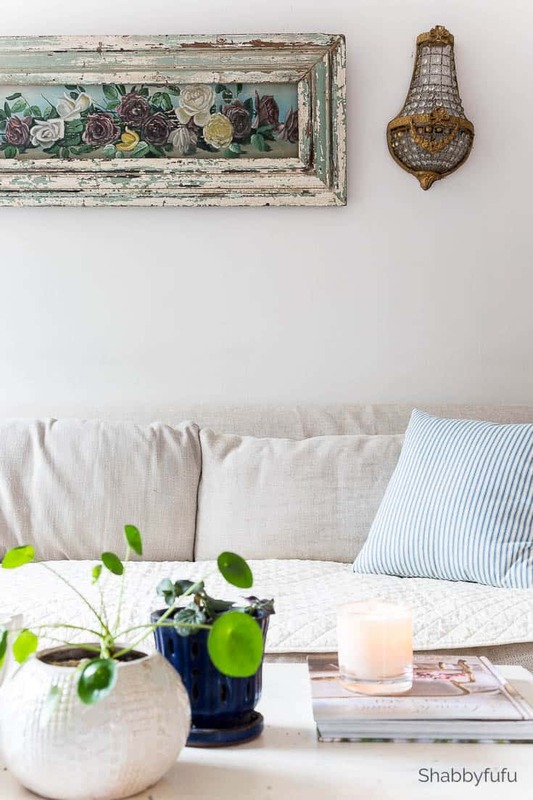 If you’re looking to be budget friendly or find a temporary solution to tide you over until budget allows new, quick weekend projects may be just what you need to consider. 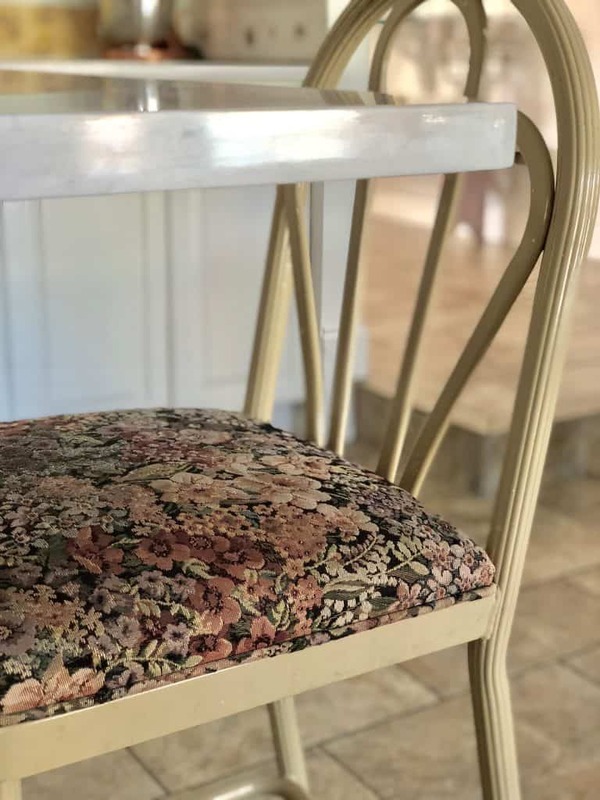 I have TWENTY Reupholstery tips for you HERE with detailed instructions as well! So tell me…what’s on your list? I’m going to be painting some chairs to go on the porch this weekend! Adding back my buffet doors (painting them first) and working on my potting shed floor!! I love the quilt on your sofa Janet! Does is have 3 seat cushions under there or just one long one? Hi Tracey….thanks for visiting! There are two long pillows on this 90″ sofa. Hope this helps and enjoy your weekend! Toby is so cute a French poodle! Love his sweet face! Interested to see what you have picked to replace current couch. I have been thinking about the ikea slip covered couch’s! 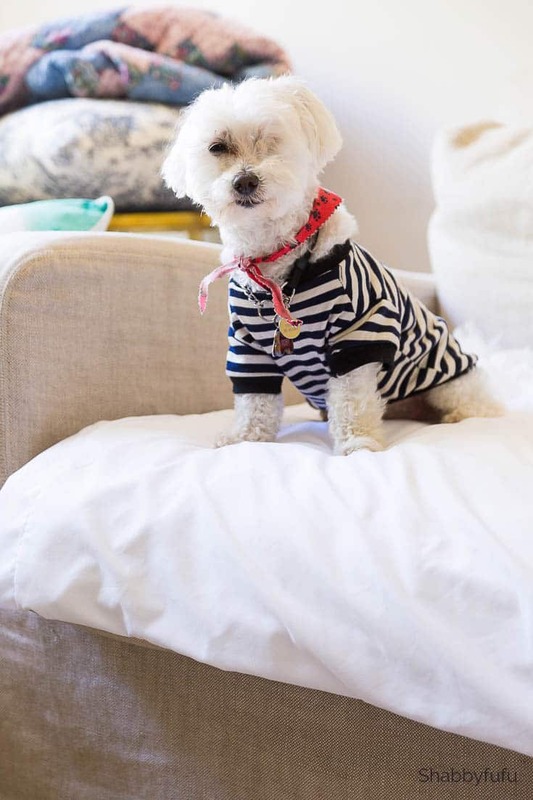 Toby is actually a Maltese, but does look sort of poodle-ish! I’ll be posting my new sofa soon with all the details! Thank you Barbara….projects are such great fun!